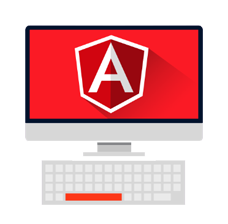 Angular JS is structure wise framework for dynamic web application development. It gives you a chance to utilize HTML as your layout and gives you a extend HTML's syntax to express your application's segments clearly and briefly. Angular's information tying and reliance infusion take out a great part of the code and you have to write some simple code for application development. Further more, everything happens inside of the browser, making it a perfect accomplice with any server technology. Angular js is website development framework under management by Google and it is open source license. Our aim is deliver quality web based solution to our clients and we also do our good to provide them with the always desired solution to satisfy business related requirements. We are always having access to latest technology tools and techniques with hire number of professional developers for angular JS. We're providing cost effective solution to our clients ever. If you want to develop website using the latest Angular's Techniques, Welcome to our warm desk for web, cloud, and mobile app development services.